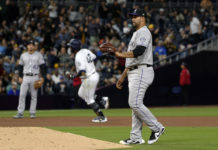 For the second time this series, the Colorado Rockies fell victim to a walk-off defeat, this time at the hands of Jose Martinez. After a red-hot July, the Rockies have now dropped their first two games of August, losing Thursday afternoon to the St. Louis Cardinals 3-2. Cardinals starter and 2018 All-Star Miles Mikolas came out firing on all cylinders, striking out the first two batters of the afternoon and setting the Rockies down in order 1-2-3. Rockies starter Antonio Senzatela followed suit, setting down the first two batters before a single by Tyler O’Neill got things going for the Cardinals. Senzatela would escape the opening frame unscathed after a phenomenal play by Tony Wolters to rob Marcell Ozuna of a base hit. After five straight outs to start the game for the Rockies, Gerardo Parra finally got the Rockies into the hit column, but a ground out by Ian Desmond stalled the two-out rally in the second. Both starting pitchers led the way for the first 2 1/3 innings before the Cardinals broke though in the bottom of the third after a sacrifice fly by O’Neill to score Mikolas. The Cardinals’ starter led the off the third inning with a single and advanced to third on a passed ball during a 12-pitch at-bat by Yadier Molina. The Rockies punched right back after a leadoff single by Arenado and bunt single by Carlos Gonzalez gave Colorado runners on first and second with no outs in the fourth. A phenomenal diving catch by O’Neill to rob Trevor Story of a hit paved the way for Parra with runners on the corners and one out. A sharp single to left scored Arenado to the tie the game, and just a batter later, the Rockies took the lead after a throwing error by Mikolas, who threw the ball to right field on an infield single by Ian Desmond. After a leadoff walk in the bottom half of the fourth, Senzatela found his rhythm once again, inducing a weak fly out to right and a ground ball resulting in a double-play turned by second baseman DJ LeMahieu, who was activated off the disabled list prior to the game. Mikolas also bounced back with a nine-pitch inning, setting the Rockies down in order to start the fifth. Senzetela maintained the Rockies’ lead with another solid inning after striking out Bader and inducing two fly outs by Mikolas and Molina. The pitchers duel continued into the sixth as Mikolas set down Gonzalez and Story to start the inning before another single by Parra gave the Rockies a two-out baserunner. Parra’s third hit of the day extended the inning to Desmond, who grounded out to third, stranding Parra. A lead-off walk by Senzatela put the tying run on first with no outs in the sixth and it seemed as if the Rockies were going to get out of it after two fly outs and a strikeout, but a mental error by Wolters extended the inning. After a dropped third strike, Wolters threw the ball to second base thinking there was one out, when all he had to do was throw the ball to first and the inning would’ve been over. 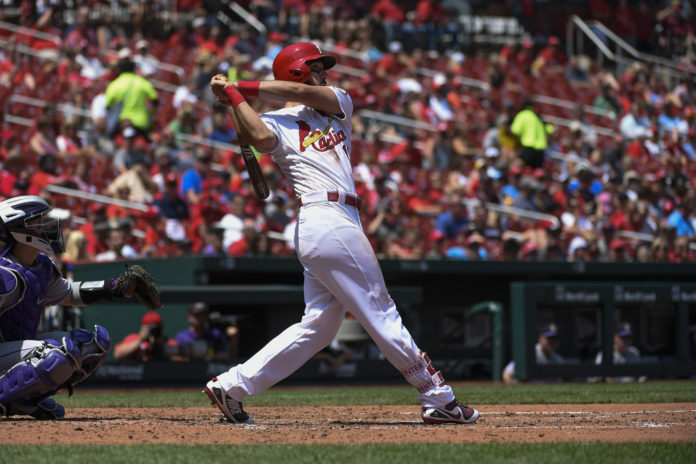 Senzatela proceeded to hit the next batter, loading the bases for Bader, who’d fortunately strike out – leaving the bases loaded for the Cardinals to end the sixth. 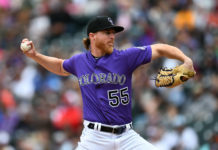 Senzatela’s day would be done after the sixth, turning in a quality start for the Rockies by going six innings, striking out five, while giving up just five hits on 96 pitches. Senzatela’s counterpart, Mikolas, pitched through the seventh, turning in a quality start of his own by striking out six, while giving up seven hits on 98 pitches. Still holding a 2-1 lead, the Rockies turned to recently-acquired reliever Seung-hwan Oh in the bottom of the seventh. Oh struck out the first batter he saw – pitch-hitter Dexter Fowler – before a Carpenter fly out and Molina ground out ended a perfect bottom half of the seventh. After a scoreless top half of the eighth, the Rockies turned to Adam Ottavino to preserve their 2-1 lead. Just like Oh did the inning prior, Ottavino struck out the first batter he saw before walking Paul DeJong to put the tying run on base. Just a few pitches later, DeJong was cut down by Wolters and LeMahieu when he tried to steal second base. DeJong was originally ruled safe, but was subsequently overturned by replay. A fly out by Gyorko gave the Rockies a 2-1 lead going into the ninth as they’d turn to closer Wade Davis. Davis got the leadoff batter to ground out to Arenado before allowing a base hit to put the tying run on first with one out. A single by Bader advanced Greg Garcia to third to give the Cardinals runners on first and third with just one out. Cardinals pitch-hitter Jose Martinez was called into action, looking to play hero for the Redbirds as Bader advanced to second on a stolen base. With the winning run on second, Martinez shot a high fastball into the gap to give the Cardinals the victory and Davis his fourth loss of the season. The Rockies’ record now sits at 58-50 and moves them a game and a half behind the Arizona Diamondbacks and Los Angeles Dodgers for first place in the NL West. Colorado will be back in action tomorrow night when they head to Milwaukee for a weekend series with the Brewers, who lead the National League Wild Card chase.